Indigenous populations are the truly guardians of our environment, without their knowledge and protection some areas around the world would be devastated, these images were taken during the First World Games of Indigenous Peoples in Palmas – Tocantins, Brazil on November 2015 to show the humanity and diversity of the indigenous population attending the games. 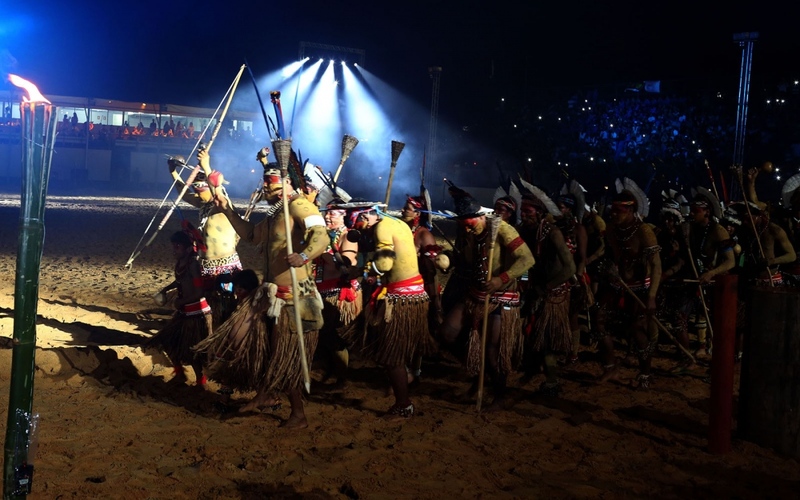 The demonstration games with 22 invited countries and 24 Brazilian ethnic groups represented the largest gathering of native culture. The Rikbaktsa live in 3 indigenous land: Erikpatsa, Japuíra and Escondido, all of them located in the county of Juína (MT). According to FUNASA, as of 2010, the total population of this Ethnicity was of 1.324 individuals. The first record of contact with non-indigenous was in 1940 with the arrival of the tappers in the region. They have always protected their lands, and, because of that, were know as warriors. The peaceful relation between indigenous and white people occurred only from 1957 to 1962. They speak the Rikbaktsa language, from the linguistic root Macro-Jê. The self denomination Rikbaktsa means "the human beings". But locally they are known as boatmen for their skill with canoes. They are also called "wooden ears" for they use big "botoques" made of small boxes and inserted into the extended lobe of the ears. 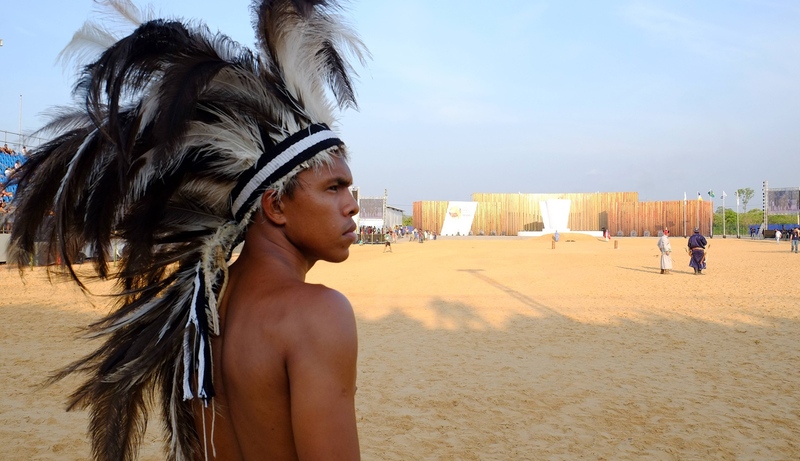 The Xerente live in the State of Tocantins and they are divided into 2 indigenous lands. A FUNASA study of 2010 recorded 3017 indigenous of this ethnicity. The first contact with non-indigenous was through Jesuit missions and through settlers that exploited the area still in the 18th century. In the 19th century the govern created military prisons where there was in their majority, Xerente and Xavante indigenous. Around 1940, after the separation of the Xavante, the Xerente were threatened by farmers and landlords from the region. The situation only got better when the IPS (Indian Protection Service) created 2 posts, after a complaint of the Ethnologist Curt Nimuendajú. They speak a dialect from the family Jê from the linguistic root Macro-Jê. The Xerente name was given by white men that were trying to differentiate them from other groups of the region, but their self denomination is Akwe. The rituals are a part of their everyday life. 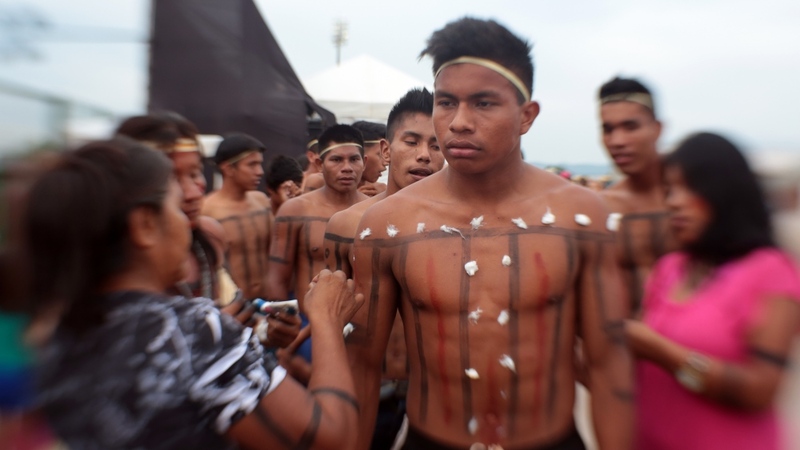 They have masculines ceremonies, nomination groups and age classes based on parental relations. Famous for their work with golden grass, they produce several types of handicraft items with this material like headdresses, skirts, handbags, purses, earrings, necklaces and bracelets. Originally the Terena lived in the state of Mato Grosso of South, and they are divided into 16 indigenous lands and can also be found in the states of Mato Grosso and São Paulo. The fight for the demarcation of the land is constant for there are still territories to be limited. According to a study conducted by FUNASA, in 2009, there were 24.776 indigenous people in this ethnicity. The origin of the Terena is Paraguayan and it is believed that they arrived in Brazil in 1760 due to conflicts with the Spanish. This movement went on up until the middle of the 19th century. The Guaná - as they (Terena) were called when they did this crossing - stayed a period without contact with the white men due to indigenous resistance. A more intense approximation took place only years later with the war between Brazil and Paraguay. The Guaná territory would be on the border between the countries and they opted to defend their lands along Brazil. 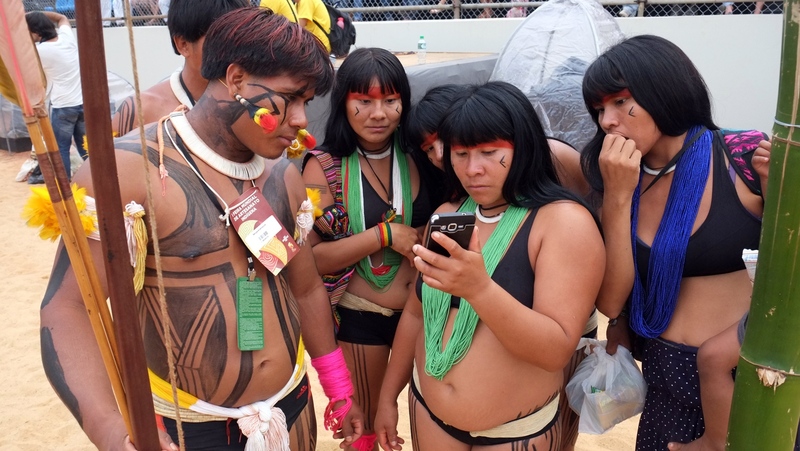 After this episode, the group started to divide thus giving birth to the indigenous group Terena, and the growing contact with the Brazilian non-indigenous. 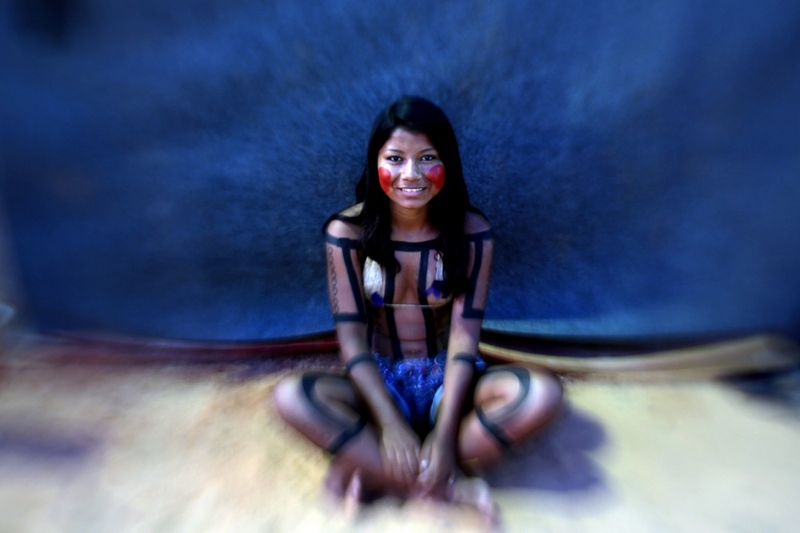 They speak the Terena language from the Aruak family, and the Portuguese is also very used. They call themselves Terena and this name is in historical records without derivations. The Terena have a strong relation with the witchdoctors, that, in specific rituals spend the night singing and seeking contact with guiding spirits to have good harvests and put away spells. The Kamayurá live in Mato Grosso at the National Park of Xingu, region known as the High Xingu and are divided into 3 villages: Morená, Jacarezinho and Kamayurá, the main village. 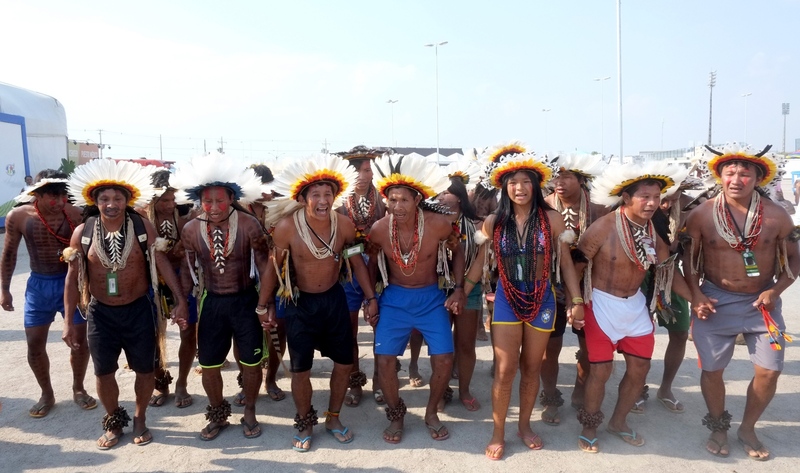 Research from IPEAX (Xingu Ethno Environmental Research Institute) conducted in 2011 recorded 467 Kamayurá - total population. The first contact with non-indigenous occurred through the anthropologist and exploiter doctor Karl Von Den Steinen during one of his expeditions to Central Brazil in 1884. After that the contact became regular with the Vilas Boas brothers. 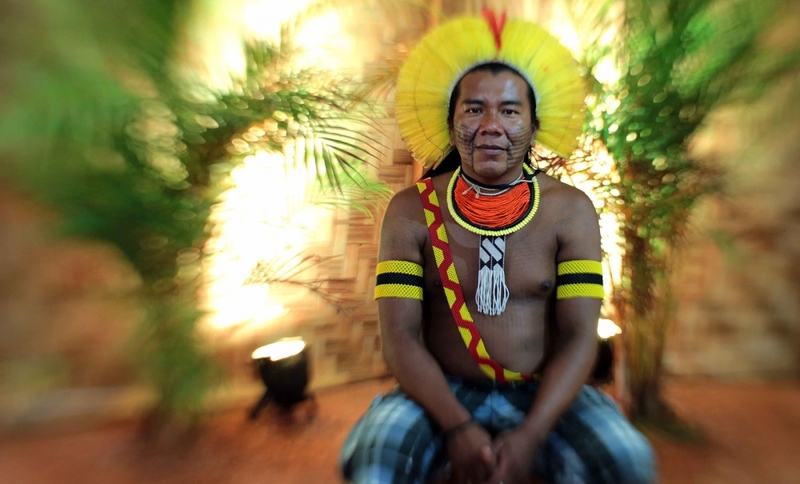 The Kamayurá speak the Tupi Guarani language, belonging to the Tupi root, and share several cultural aspects with neighbor peoples in the National Park of Xingu, such as: Village format, malocas, food habits, ornaments and intertribal rites, due to the strong intertribal contact that started ages ago. Their rituals are related to the stages of life. The most known is Kuarup, realized in the death of someone. Another sacred ceremonies happen when someone goes from childhood to the adult life, and harvest. 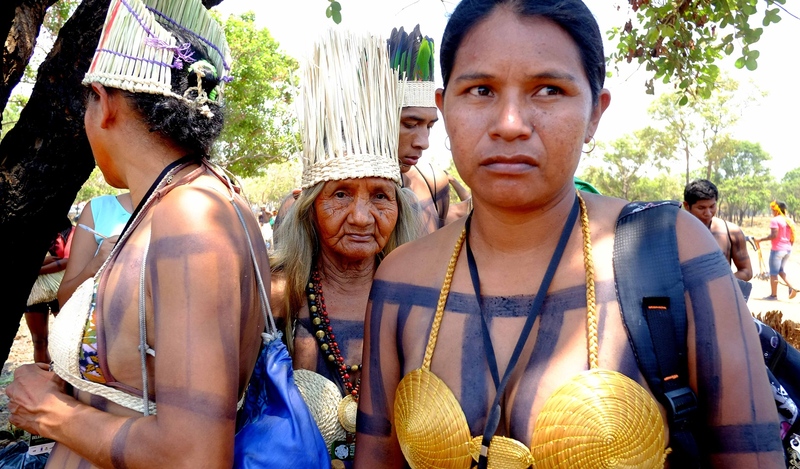 The Kamayurá women adorn themselves with beads necklaces, ties in their legs, and paintings on their faces and bodies made with Jenipapo and Urucum. 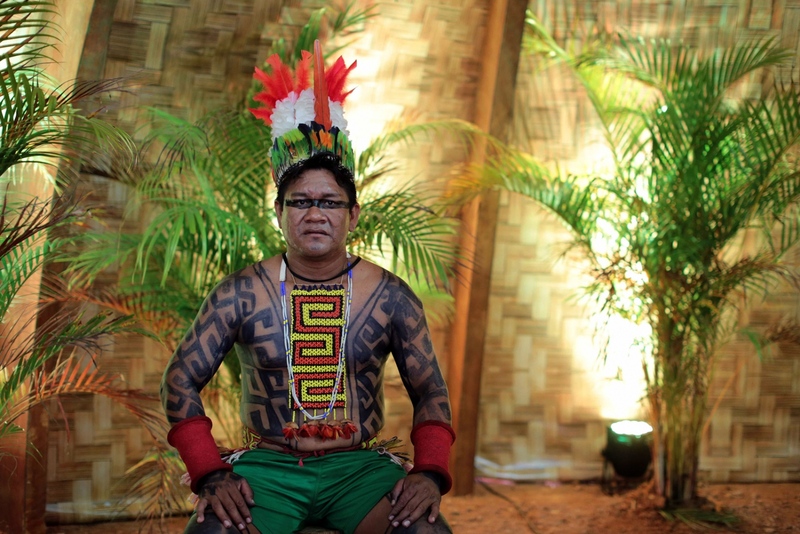 Now the men paint their hair with Urucum, use Snails necklaces, beads belts, and paint their bodies with Jenipapo. They practice corporal fight and play Ywa Ywa. 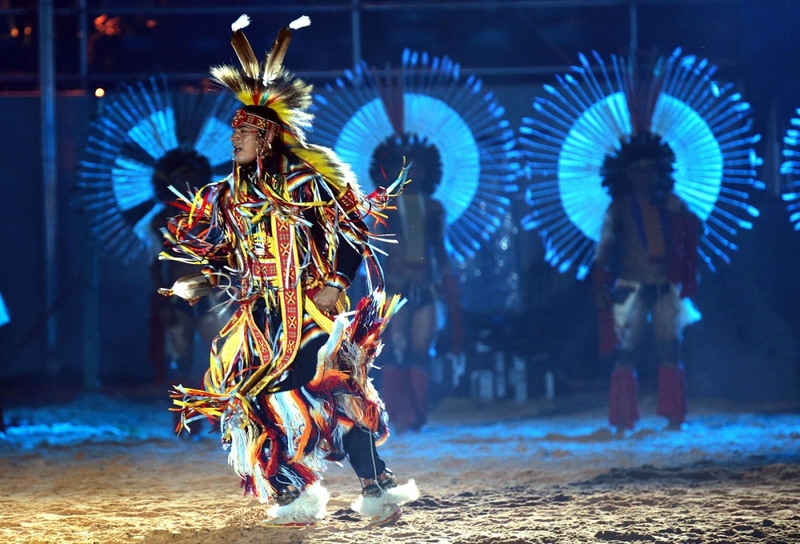 The Cree are one of the largest groups of First Nations in North America, with over 200,000 members living in Canada. The major proportion of Cree in Canada live north and west of Lake Superior, in Ontario, Manitoba, Saskatchewan, Alberta and the Northwest Territories. 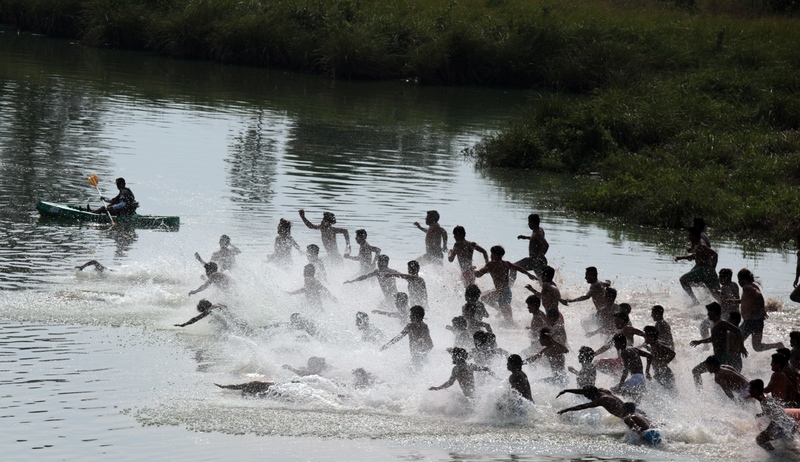 Indigenous people swim on the Tocantins River in Palmas, Brazil during the first Indigenous Peoples Games. 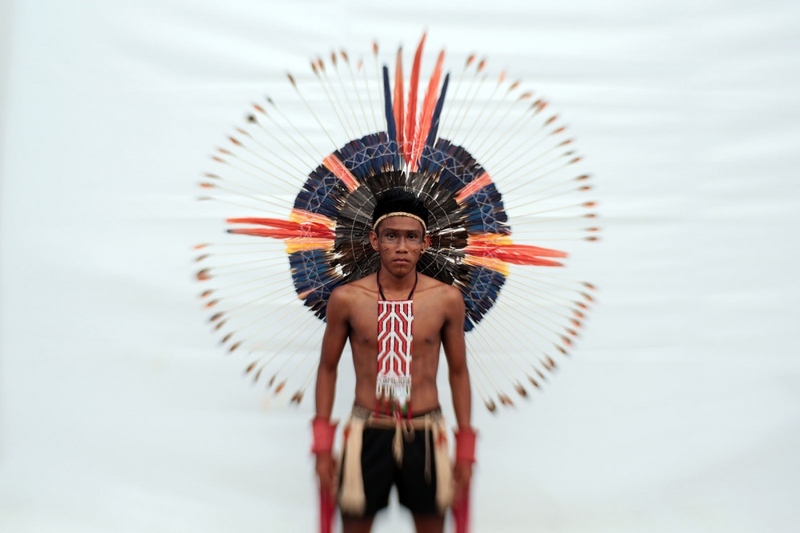 The Paxató are divided into the extreme south of Bahia and the North of Minas Gerais. According to FUNASA, there are nowadays 11.833 indigenous from this Ethnicity. According to the historic records, the first contacts with the Pataxó occurred in the 16th century by settlers that described them as friendly people. Since then they have contact with non-indigenous and fight constantly by the maintenance and preservation of the national culture. Originally they speak the Patxohã language. However, due to the intense relationship with white men , the dialect was forgotten and, for years, it was considered non-existent also due to the valorization of the Portuguese language. Since 1998 the indigenous seek to recuperate the mother language, belonging to the linguistic family Maxacalí, from the root Macro-Jê. The name Pataxó is the own self denomination of the group. Xerente women help a warrior with his body paint. 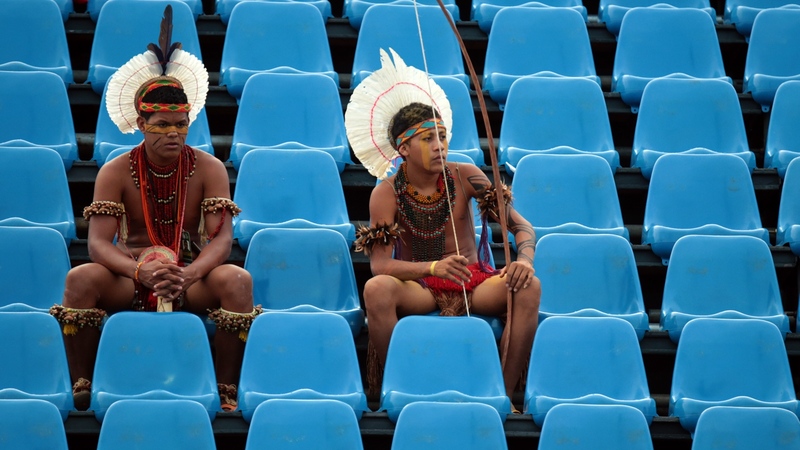 Paxató warriors are seen in the stands during the games. Distributed along the state of Mato Grosso, the Bororo Boe are divided into six villages: Teresa Cristina, Jarudore, Merure, Perigara, Sangradouro/Volta Grande e Tadarimana. In the last counting done by Siasi/Sesai, the total population was of 1.686 habitants. The first contact with non-indigenous was over 300 years ago. They belong to the linguistic family of Bororo, from the linguistic root Macro-Jê. In their language, the Bororo term means "village courtyard", due to the circular traditional disposition of the houses that keep the courtyard in the center. They call themselves Boe. Located in the county of Tucuruí, PA, the Asurini habit the indigenous land called Trocará, which is 30 kilometers away from the Tucuruí's Hydroelectric power plant, and it shelters the highway PA-156 in all its width. Researches from 2012 conducted by Siasi/Sesai accounted for 516 people of this ethnicity. According to registers from the pioneer front, the first reports about the Asurini come from the beginning of the 20th century from an area is right above the Itaboca waterfall. The place ended up becoming an area where the Brazil nut is exploited. After that, with the construction of the Tocantins railroad line, the indians fought back these invasions fighting against the non- indigenous people that exploited the region. In 1953 the contact with this people was made official by the attraction front of the Indian Protection Service. The term Asurini comes from the Juruna language and since last century it has been used to refer to different tupi groups from the area. Also known as Asuriní from Trocará and Akuáwa- Asuriní, they used to call themselves Akuáwa, but with time they recognized the name Asuriní, as they prefer to be called. Nowadays they speak Portuguese, though their native language belongs to the Tupi-Guarani root. The Karajás are divided between the States of Goiás, Mato Grosso, Pará and Tocantins. Most of them still live in the original territory, by the margin of the Araguaia River, Tocantins. By the FUNASA counting made in 2010, the population is of 3198 people. History tells about 2 fronts of white men with the Karajá. The first one represent by the Jesuit missions in 1958, with the Indigenous of the Low Araguaia. The second, led by the Paulista leaderships, towards the Center West, between 1718 to 1746. They speak the Karajá language from the linguistic root Macro-Jê. Their name was given by another groups, but we don?t know which one, and it means "big monkey". 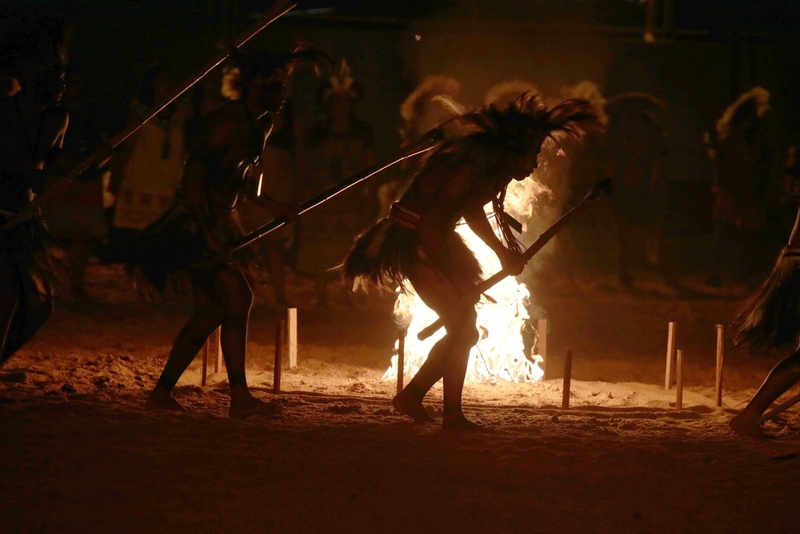 The Kuikuro live in the National Park of Xingu, in the area known as the High Xingu, in Mato Grosso. They are divided into 3 villages: Ahukugi Lahatuá, e a principal, Ipatse. In 2011, a study conducted by Ipeax counted 522 individuals in this population. The first contact with non-indigenous people is recorded in the documents of the Anthropologist and Exploiter Doctor Karl Von Den Steinen, in 1884 and 1887. Steinen is recalled in the Kuikuro narratives as Kalusi, the first white (kagaiha), that came in peace, bringing gifts and goods to exchange. The Kuikuro received this name from Karl Von Den Steinen that tried to register the speakers of the Karíb language from the Kuhikugu village habitants. The self denomination is always given by the local name or the name of the village, following the term ótomo, "owners or masters", for example "Ipatsee ótomo," in other words, owners of Ipatsee. 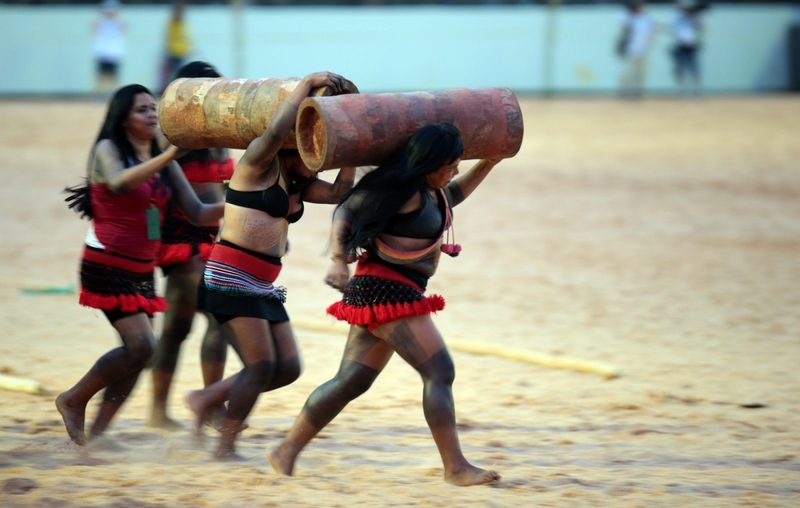 The Paxató are divided into the extreme south of Bahia and the North of Minas Gerais. According to FUNASA, there are nowadays 11.833 indigenous from this Ethnicity. According to the historic records, the first contacts with the Pataxó occurred in the 16th century by settlers that described them as friendly people. Since then they have contact with non-indigenous and fight constantly by the maintenance and preservation of the national culture. Originally they speak the Patxohã language. However, due to the intense relationship with white men , the dialect was forgotten and, for years, it was considered non-existent also due to the valorization of the Portuguese language. Since 1998 the indigenous seek to recuperate the mother language, belonging to the linguistic family Maxacalí, from the root Macro-Jê. The name Pataxó is the own self-denomination of the group. The Kalima, also known as the Caribs or mainland Caribs and several other names, are an indigenous people native to the northern coastal areas of South America and one of six American Indian tribes of French Guiana. Today, the Kalina live largely in villages on the rivers and coasts of Venezuela, Guyana, Suriname, French Guiana and Brazil. They speak Cariban language also known as Carib. They food base is cassava and their traditional meal is kashilipo which is cassava juice with fish, and their traditional drink’s the kashiri which is cassava juice with the dye of a sweet potato. The Kalima traditional dance's sampula (drum) and kalawashi (maraca) which is practiced especially for traditional ceremonies. 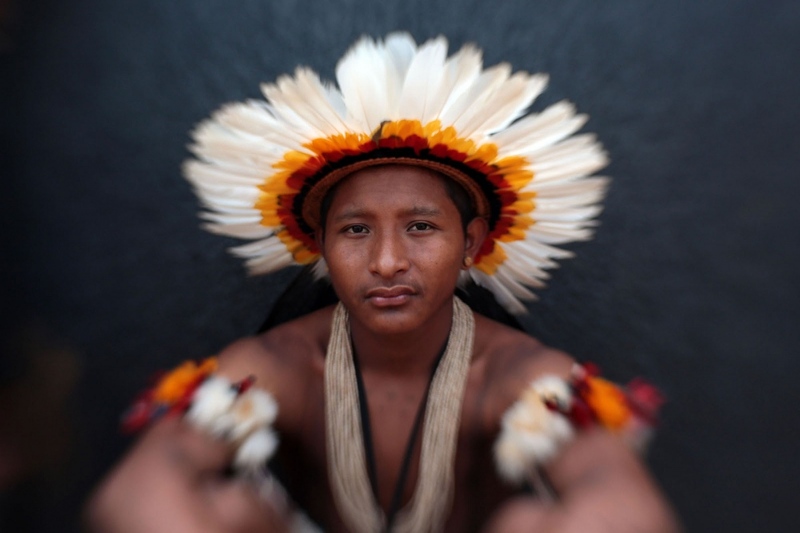 They live in 3 indigenous lands in the state of Mato Grosso and Tocantins, and one of them is shared with the Karajá. The origin land, according to the Tapirapé, is the Mountain of the White Vulture. According to FUNASA, in 2010, there were 655 individuals in this ethnicity. Between 1910 and 1947, the Tapirapé received constant visits from officers of the IPS (Indian Protection Service), from missionaries, anthropologists and latex workers. During this period there was a decrease in the population and the contact with non-indigenous started to be monitored to avoid the extinction of this people. 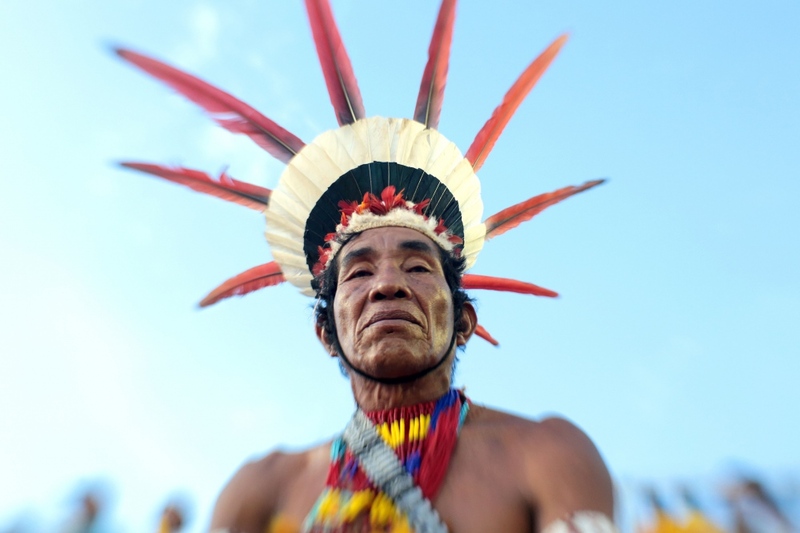 Due to the constant attack from other people, specially the Kayapó, the Tapirapé divided themselves and, years later, got together again to fight for the demarcation of their origin lands. 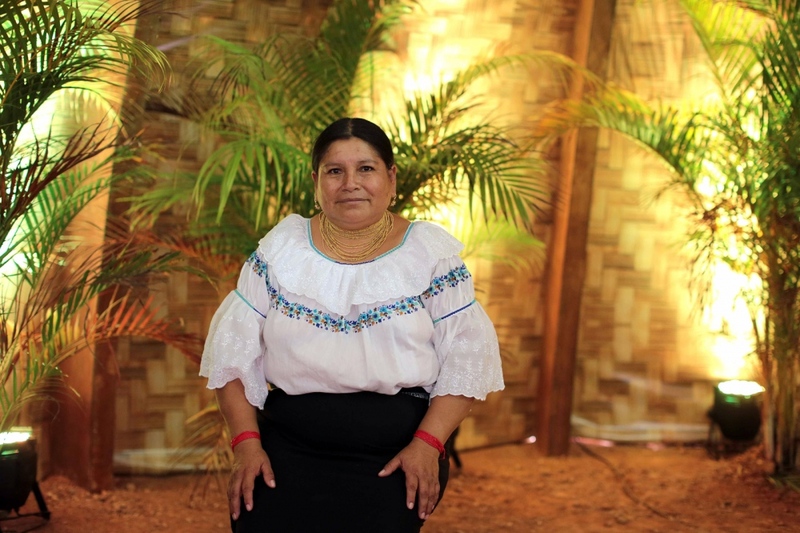 They speak the Tupi language and the origin of the name Tapirapé is unknown. They are also known as Apyãwa. 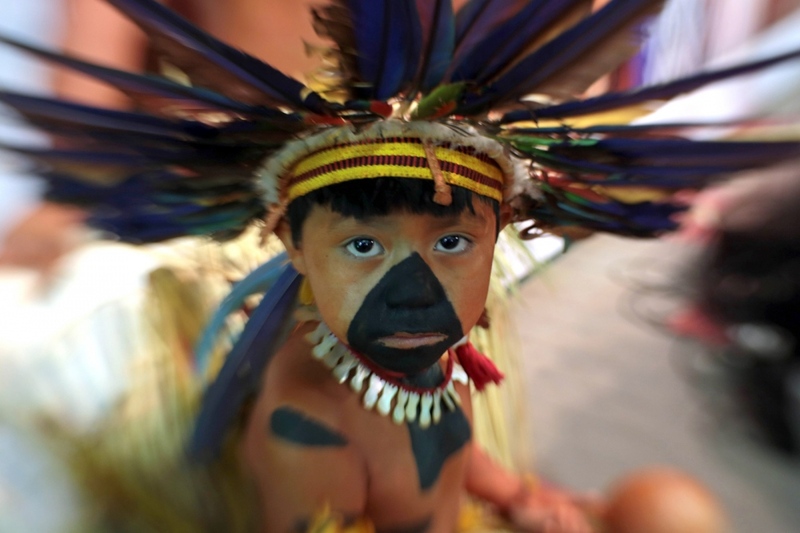 The Kayapó live in Para and in the North of Mato Grosso spread over 9 indigenous land. A study conducted by FUNASA in 2010 recorded 8638 indigenous of this ethnicity. The first contact with non-indigenous were in the 19th century, and considered a disaster for there was an unequal competition. 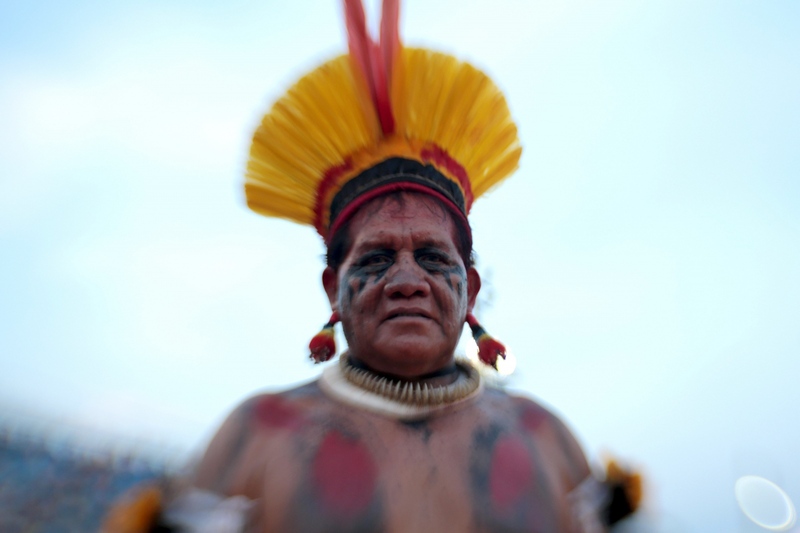 Os Kayapó suffered attacks from settlers the massacred them selling them as slaves. This caused this people to move to the westerly area of the country, seeking refuge. After 30 years, there was another contact through the Expansion Front that divided the Kayapo into 2 subgroups: the ones who chose to relate to the white, and the ones who chose to isolate themselves. Those who opted to have contact with the white were murdered and extinct. In the 60s a new front of contact was realized. This time, a more careful and planned one, bringing a permanent relationship with the national society. They speak one language of the Jê family from the root Macro-Jê. 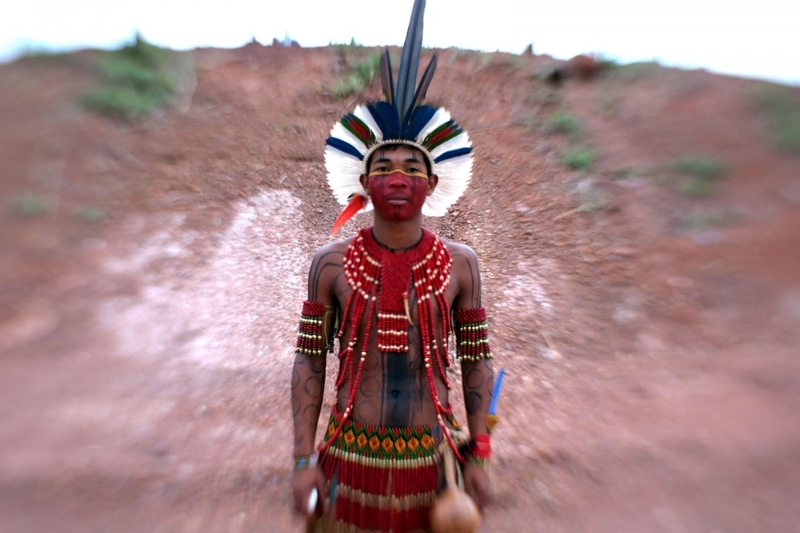 They were called Kayapó by their indigenous neighbor groups, which means "those who look like monkeys". But they call themselves Mebengokre, "the men from the hole, or water place". To this ethnicity the relation with the nature is of extreme importance. Therefore they always make rituals marked by chants and prayers to protect the area. They believe that the more you socialize with the environment, the better to the local, diminishing the chances that human and animals spirits will get mixed. The rituals are divided into 3 categories: name confirmation, agricultural (fishing and hunting), and passage. They are known by the precision in the features of the ethnical graphics, made with coal and Jenipapo. 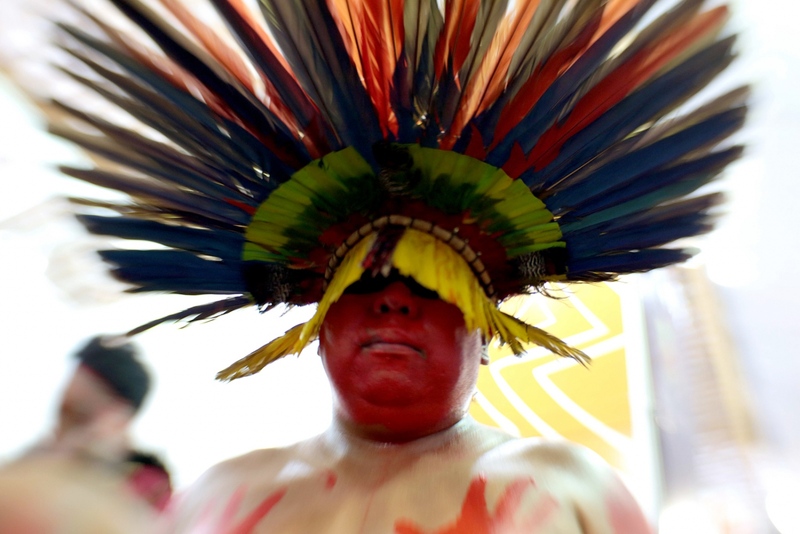 The men adorn themselves with macaw feathers headdresses and the women with long beads necklaces and bracelets. With a population around 2.5 million, the Quichua of South American are the largest of any indigenous peoples in the Americas today. Aymara-Quechua languages (which have many spoken dialects) are collectively the most widely spoken of all indigenous languages in South America. The Quichua are also the only people to have migrated both south along the ridges and valleys of the Andes mountains and east into the rainforest of the Amazon Basin. This early divergence in their migration paths has created distinct mountain- and jungle-Quichua identity and culture. The Quichua were among the earliest peoples to be conquered by the Inca empire. Ironically, the Inca empire itself consisted mainly of people who spoke the same Quechua language! It wasn't until Spanish colonization, though, that their population level fell drastically. One of the most important dates in history is associated with this decline. November 16, 1532 marked the capture of the Inca Emperor, Atahuallpa, by the Spanish conquistador, Francisco Pizarro. This blow to the Incas was the single biggest factor in allowing further Spanish expansion in the region, bringing with them the diseases that would eventually wipe out millions of native peoples. 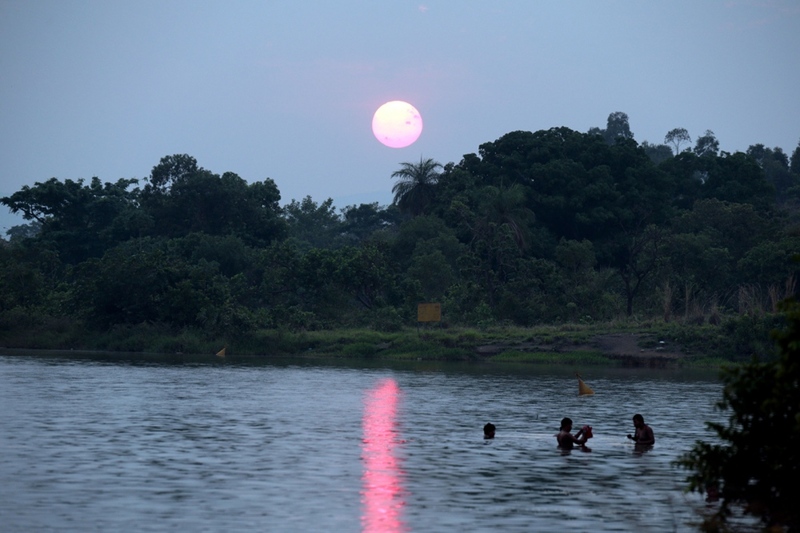 The Javaé people live in the Bananal island, the biggest fluvial island of the world, on the border between Tocantis and Goias. They share the area with 2 more people, the Xambioá and the Karajá. They are divided into 13 villages along the river Javaés, and only one of them stays inside the island. A FUNASA study from 2009 accounted for 1456 individuals, representing the total population of this ethnicity. The first contacts with the non-indigenous were in the beginning of the 20th century. Before that, the contact was made through the Karajás, secular habitants of the margins of the Araguaia River. With the demographic reducing of the indigenous areas, the Javaé nominated the white "Big Wizards". They speak the Karajá language, just as the other habitants of the island. There is however a difference between the languages that is still being studied by the linguistic. Yet, they are all from the linguistic root Macro-Jê. The Javaé name is unknown to historians and anthropologists. They also call themselves Itya Mahãdu "the people from the middle" for they live in the intermediary level of the cosmos between the underwater and the sky. 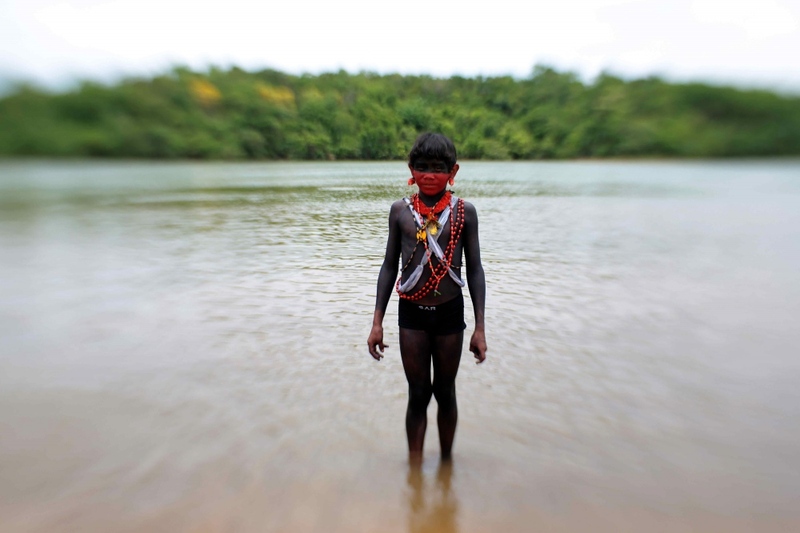 One the most important rituals of the Javaé is the Aruanãs Dance, when the living water spirits leave the water attending the calling of the Shamans to get to know the life on the Earth. They also have initiation rituals, harvest and matrimonial. 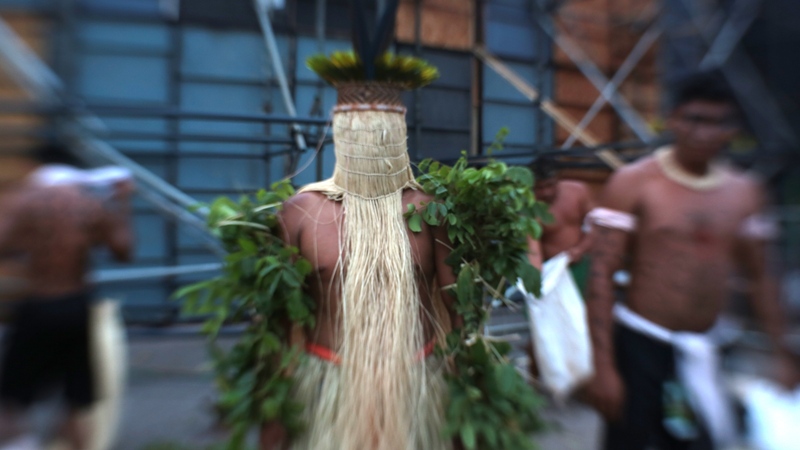 They commonly tie red tissues to their legs and the graphics on the body is made of Jenipapo. 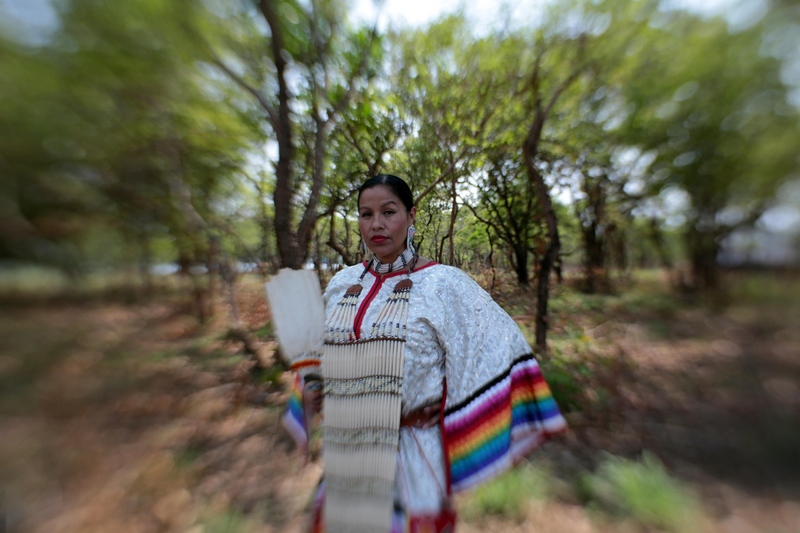 The colored headdresses have different shapes, whereas the necklaces are made of beads and form the main graphics of this ethnicity. 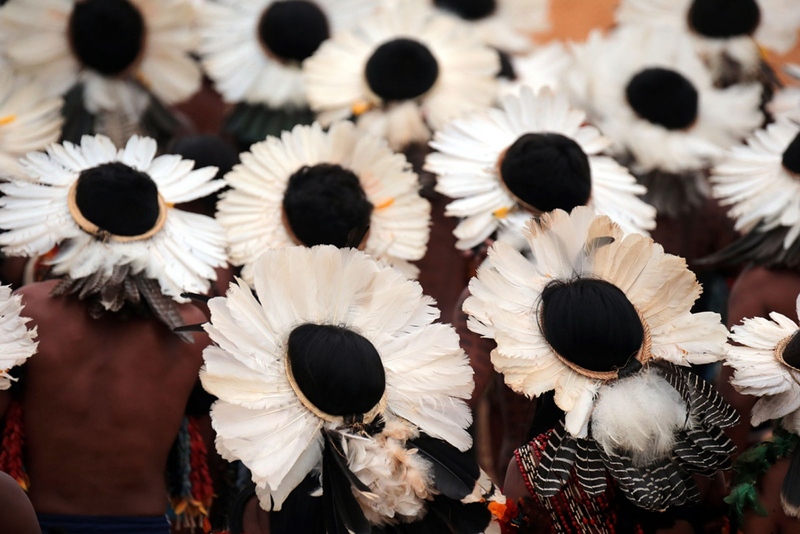 In some rituals the body is adorned with silk or white feathers. The Māori of New Zealand are settlers from eastern Polynesia, who arrived in New Zealand in several waves of canoe voyages at some time between 1250 and 1300 CE. Over several centuries in isolation, the Polynesian settlers developed a unique culture that became known as the "Māori", with their own language, a rich mythology, distinctive crafts and performing arts. Early Māori formed tribal groups, based on eastern Polynesian social customs and organisation. Horticulture flourished using plants they introduced, and later a prominent warrior culture emerged.